Amberth project managed the design, management and build of this large family home in Wyndham Road, Oxford. 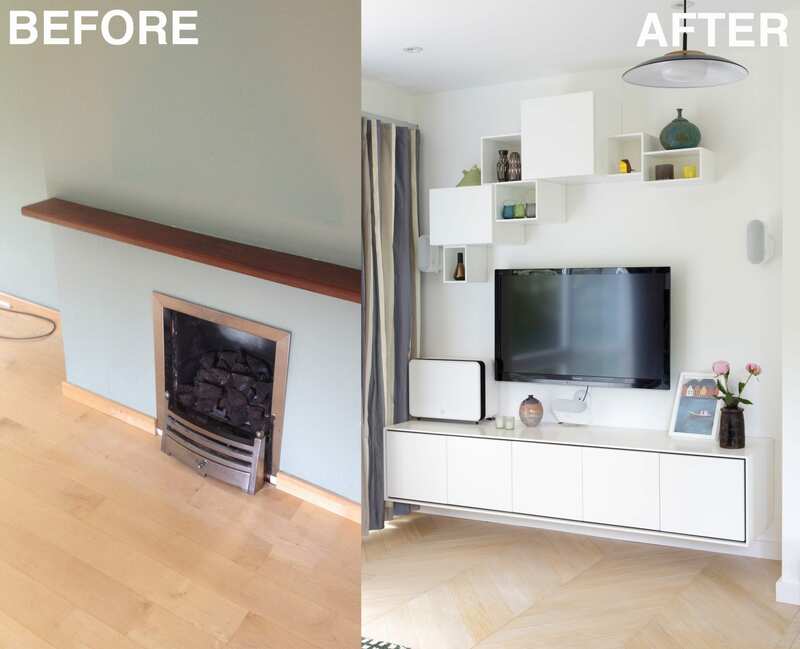 To view the full interior makeover click here. 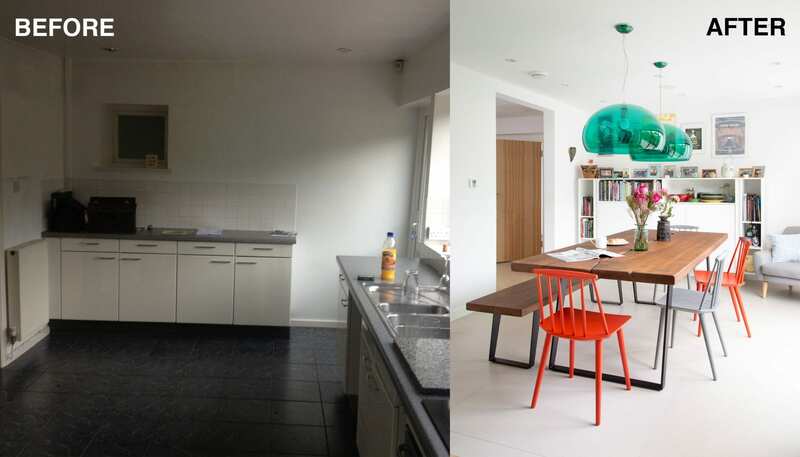 The original kitchen had an awkward arrangement with limited storage and worktop space and limited light coming in. Therefore, the space was transformed into a bright dining room to allow a continuous spread of natural light enhancing the overall space. A lovely sized dinning table and a freestanding storage unit and a gorgeous mix of colour create an upbeat vibe whilst the bespoke multi-functioning storage unit allows the space to be personalised. Located opposite of the original kitchen was a small passageway to a room that was awkward to access and move around in. Therefore, the layout was re-worked so the new kitchen would occupy this space. The opening knocked down to increase the size of the passageway and this would serve as a direct link to the new kitchen. Plenty of storage is available in this kitchen along with a gorgeous view into the garden to create a warm, laid-back ambience.The open shelving and a flexible hanging solution adds continuity to this laid back feel. 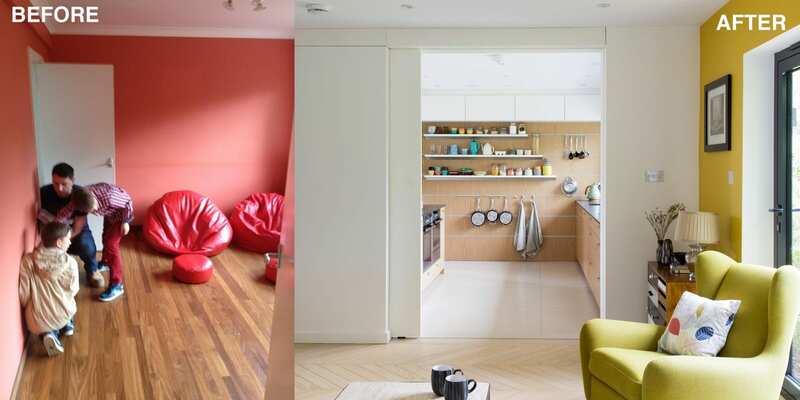 To maintain an open-plan layout the wall leading onto the living room was knocked down and replaced with sliding doors to allow the closure of the kitchen space whilst cooking. 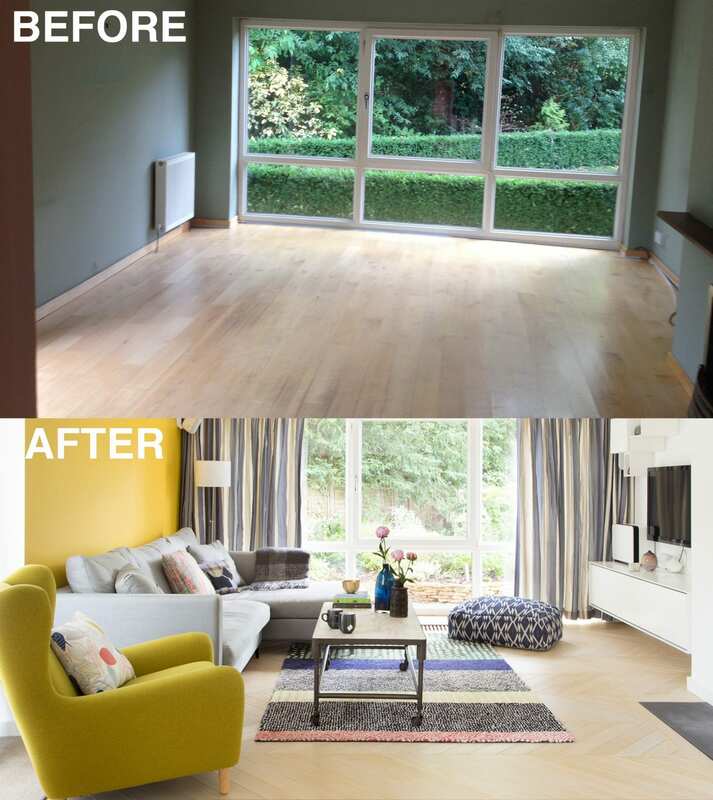 The original living room had large windows and they demonstrated a great potential for natural light so these were replaced with bi-folding doors with large windows to allow for maximum natural light. This door allows for direct access to the garden from the living room and bright yellow feature wall compliments the light enhancing the vibrant, upbeat feel. The eye-catching mix of mid-century modern furniture and contemporary bespoke wall units, designed by Amberth, work in rhythm with the living space. The wall mounted bespoke units designed and produced by Amberth keep all media devices discretely tucked away for a seamless and minimal look. The open shelving, distinctly arranged above the floating, wall mounted shelving below, allows the client to inject their style and personality further with home accessories. The original downstairs toilet was a small and un-inviting space. 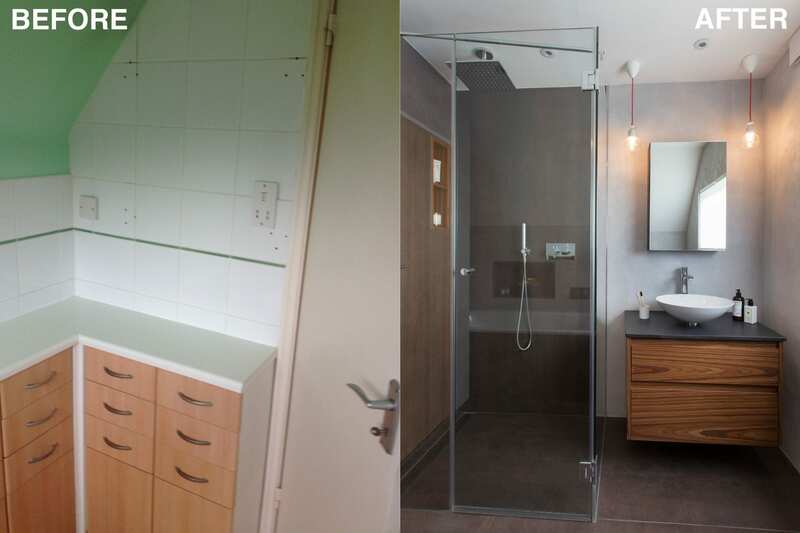 A small but perfectly formed shower enclosure was built in this bathroom with a tinted glass shower screen, a generously sized mirror with glass shelves to maximise storage space and visually increase the size. The mirrors across two walls create reflections that visually expand the space whilst the deck mounted basin, lends itself as a space saver, with a towel rail and toilet roll holder.Light coloured porcelain floor tiles are offset by dark porcelain tiles to create a contemporary look. An LED strip is located in the niche of the shower with lighter tile to create a feature wall with depth. The original staircase style was dated so it did not connect with the electic design of the home. Therefore the decorative details of the old balustrade were replaced with a contemporary styled white wash coloured soft wood. 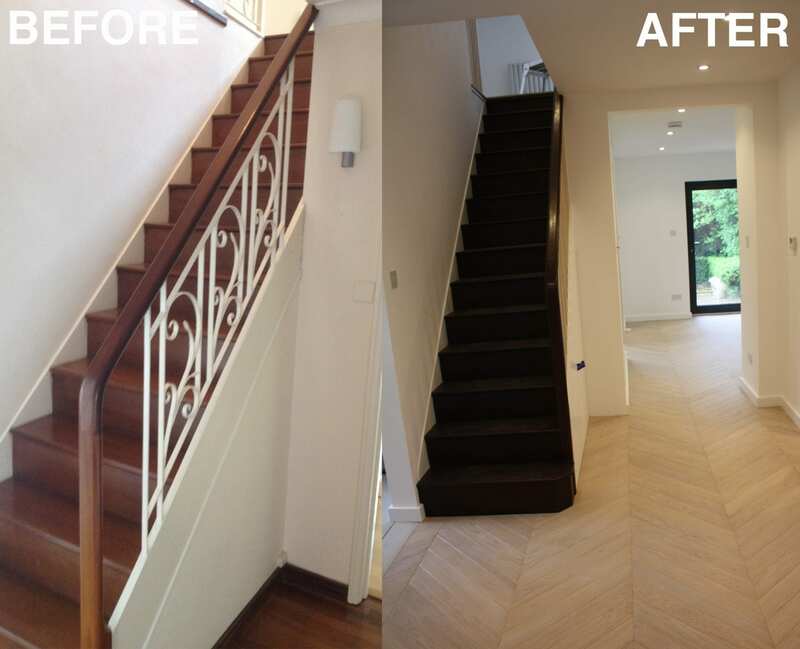 To maintain a connection with other rooms in this house and retain a fluent style the stairs were stained and varnished with an attractive oak colour coating. To maintain the contemporary feel the built-in storage beneath the stairs was built with push to open doors. The upstairs family bathroom benefits from a bath and separate walk-in shower. The two ceiling mounted lights gently bounce off the large grey and brown porcelain tiles that spread across the walls and the floor to give a statement look. A wooden vanity unit injects warmth into the space whilst the red wires give the space a playful twist. 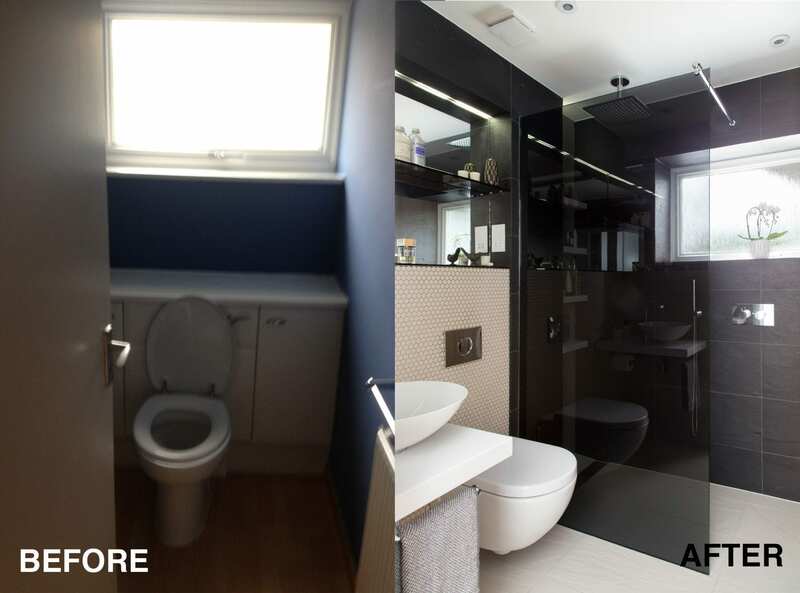 This look is complete with a mounted basin and bespoke multi-functioning storage unit to give ample storage to this small bathroom. If you are considering a home renovation then Amberth will tell you the best way to work your space in a way that suits you. Visit the studio for a quick chat or come in with drafted plans with measurements and images of the space so, we can provide design advice.